War of 1812 Through the Eyes of Children... and Primary Source Analysis Skills Too! Although I am also a participant, I had to opportunity and honor of presenting a breakout workshop at this year's History Connected summer institute. Since the focus of the institute this year is on the impact that American wars have had on American society, I reached back into my files from a few years ago when I taught U.S. history in 8th grade to find a webquest I created on the War of 1812. Teachers got to "play student" and take part in a shortened version of the 4 day lesson. Click the screen shot below to see the webquest website. Here is a brief day by day guide of the primary sources and analysis skills that students use as they complete the 4 day webquest. Students choose to be either Eliza or Joshua. Both are 14-year-olds living in the United States before and during the war. Then the students move on to reading Madison's war message explaining his reasons for asking Congress to declare war. Since the lesson was written for heterogeneous classes of 8th graders, I needed to find a way to break down the speech into manageable parts. So, I put excerpts of the speech in a worksheet with missing words or phrases. Students had to skim the speech for the excerpts to fill in the missing information and then answer guided questions that helped them understand the meaning of Madison's words. After completing this analysis, students wrote a half page journal entry from the perspective of Eliza or Joshua reacting to the news and incorporating some of the reasons for war from the primary source into their writing. After reading some brief historical background on the importance of the battle between these two frigates early in the war, students read Oliver Wendell Holmes' peom Old Ironsides, which was actually written as a memorial several decades later. Holmes remembers the reactions of his fellow Americans in his childhood during the actual war. Reading 19th century poetry is daunting for 8th graders. So this time, students are asked to choose one stanza and translate its meaning into their own words. Then, as with Day 1, students write a half page journal entry from the perspective of either Eliza or Joshua reacting to the American victory and huge boost in morale. Day 3: The Burning of Washington D.C.
On the third day students experience a big let down after the huge victory of the U.S.S. Constitution early in the war. The British successfully blockaded the entire Atlantic coast, and then captured and burned the capital, Washington D.C. This time students look at an engraving and political cartoon that were created at the time reacting to the events. They also read First Lady Dolley Madison's letter to her sister expressing her fears as the British approached the city. To understand the significance of the images, students are either asked to identify items in them or to recognize the mood of each image to interpret the reactions that people had at the time. For Dolley Madison's letter, students once again scan for excerpt in order to complete them and then answer questions about them. Finally, once again, they write a half page journal entry from the perspective of Eliza or Joshua reacting to the horrible news. On the last day of the exercise students learn about the bombardment of Fort McHenry and the events that inspired Francis Scott Key to pen the poem that would eventually become our national anthem. Once again, 19th century poetry is not the most engaging content for 8th graders, so they are asked to choose one of the stanzas that we do not sing as part of the anthem song and put it into their own words. It helps students to understand that although the bombardment caused major destruction, the fact that Americans held the fort served as an inspiration to carry on. Students then write one last journal entry reacting once again. Hopefully, after completing the 4 day exercise, students will understand the variety of emotions that can be triggered by war. Typically there is enthusiasm at the start when people believe in the cause. Early victories, like the U.S.S. Constitution, can fuel that fire. But devastating defeats, such as the burning of Washington, tend to give people a dose of the realities of war and they might even start questioning whether the war is worth the cost. The activity gives students, who have never experienced wartime sacrifice, some empathy. In order for students to truly understand, and hopefully remember, history they need to be able to relate to the people who lived it. Hopefully, this activity gave them an opportunity to do just that. How can I turn my history students into detectives? One of the most valuable skills we can teach our history students is to use evidence from the past to develop their own opinions about historical events. One popular program that many high schools use is the DBQ Project. Students use textual and visual primary and secondary scholarly sources to answer a question. For example, my sophomores recently had a class debate based in the evidence from the DBQ entitled "North or South: Who Killed Reconstruction?" Essentially, students use evidence from experts and first-hand witnesses to solve problems, just like a detective would. The program has a fabulous reputation and student essays that result are well-thought-out and evidence-based. Unfortunately, one small pitfall of the program is that it requires a lot of paper and not much technology. Why not combine technology with historical evidence analysis? I found a great website that enables student to do the same kind of analysis in a webquest style environment. Surprisingly, students are more enthusiastic about the same tasks when they can simply use a computer instead of doing the writing out with pencil and paper. Historical Scene Investigation puts famous dilemmas from history into "case files" and asks students to solve the mysteries. Students analyze primary sources, similarly to the DBQ Project, but the entire task can be done online. The Boston "Massacre": Students read about the event, sifted through both American and British first-hand accounts, and decided whether justice was served at the trial where 6 of the 8 accused British regulars were acquitted. 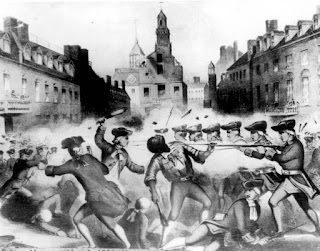 Lexington and Concord: After reading both American and British first-hand accounts, students had to decide the historical question: Who fired the first shot? 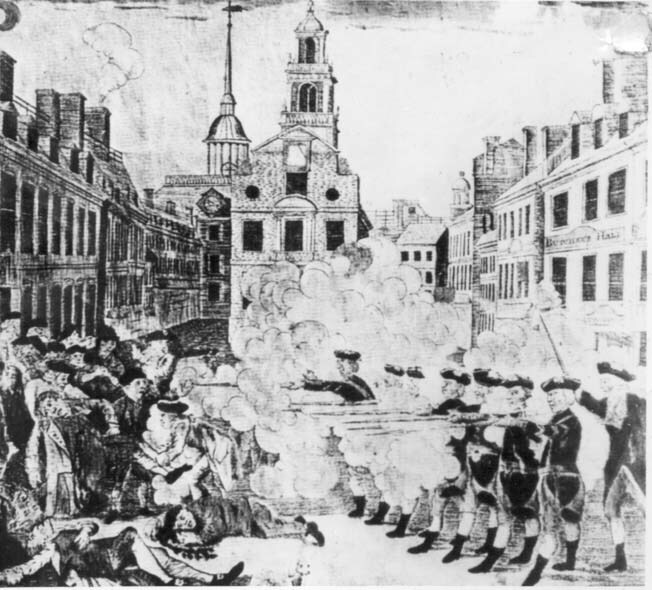 Was it the Minutemen or the British regulars? How should I introduce the website and assignment? To introduce the assignment, I also used technology. I used the SMART Recorder program, part of the SMART Technologies suite of software that comes with my SMART Board, to create an instructional video. Students watched it in class, and, if they ever got confused during the process of completing the work in class or at home, they could reference the video anytime since it was posted on our class website. What kinds of documents did students work with? The chromolithograph by John Bufford that dramatized the death of Crispus Attucks: Boston Massacre, Mar. 5, 1770. Entry for April 19th 1775, from the diary of British Lieutenant John Barker swearing that the American provincials fired first at Concord: "...a number of people, I believe between 200 and 300, formed in a common in the middle of town; we still continued advancing, keeping prepared against an attack through without intending to attack them; but on our coming near them they fired on us two shots, upon which our men without any orders, rushed upon them, fired and put them to flight; several of them were killed..."
And of course a conflicting sworn account from 34 minutemen who reported that the British regulars fired first: "...at which time, the company began to disperse, whilst our backs were turned on the troops, we were fired on by them, and a number of our men were instantly killed and wounded, not a gun was fired by any person in our company on the regulars to our knowledge before they fired on us, and continued firing until we had all made our escape..."
﻿So, how did the students do? In Document D, created by John Bufford, it shows colonists are attacking, while others are getting slaughtered by the soldiers' guns. In Document E by Alonzo Chapel, it shows colonists holding weapons attacking the soldiers. 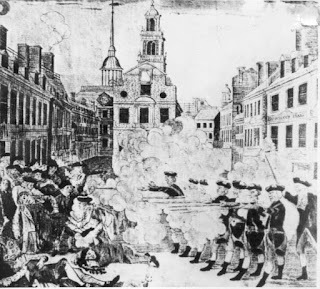 In Paul Revere's depiction, it shows innocent colonists being brutally killed. I believe that the colonists were not innocent. They did somewhat attack the soldiers. But shooting the colonists was not justified. I believe that justice was not served. How can branding someone's thumb be a justified exchange for someone's life? All of the soldiers should have been put in jail and branded because they killed a group of people over a small conflict that could have been solved a different way. The British had well disciplined soldiers who would not fire without an order. This is clear as one British soldier commented on their intent not to fire and said, "we still continue advancing, keeping prepared against an attack though without attacking them." This line clearly represents how the British did not want to fire on the Patriots. It was satisfying for me, as their teacher, to read that these 14 and 15 year old students were combining their own opinions and reasoning skills with evidence from the past. Their number grade was based on a rubric I developed according to the assignment description and class standards we have developed throughout the school year. Overall, however, I think they did pretty well, don't you? Did you know that the story about St. Patrick driving the snakes out of Ireland is a metaphor? "A metaphor for what?" you ask. Why do we associate 3 leaf clovers with this day? There are many traditions associated with today. Some, like going to church to observe the holy day, are healthy for body and soul. Some, like downing a pint or two of Guiness, are not. Where did all of these traditions come from? Watch the quick video below to find out! OK, so now you know the history. But why am I wearing green to celebrate the day? Turns out, I should probably be wearing blue! Yup, here's another quick video explanation. So, on this lovely Saint Patrick's Day, I leave you with an Irish blessing and wish you well. The final lesson of the Civil War is always the assassination of President Abraham Lincoln. This year I was searching for a new way for my students to study the information. After a little searching, I found an amazing website: The Abraham Lincoln Papers from the Library of Congress. One of their special collections is called The Lincoln Assassination. There I found broadsides, illustrations, and other publications that convey the public sentiment surrounding the shocking events of April 15, 1865. So.... here is my plan for Monday! First, I will ask the students to read this short summary of the events surrounding the assassination. Then, to make the rich primary resources into a lesson, I will divide them into 5 categories. Each category will be assigned to one of 5 small groups of students in each of my sophomore classes. To see more detail for any of these images, simply click on it. Each group/category will have three images. What you see above is just a taste. In order for students to see all of the incredible emotion that is captured in these images, I will ask them to use the following questions to analyze them in their small groups. Identify at least 3 details from the document. Write them in a list with an explanation of the importance of each detail. What inferences can you make about the feelings and intent of the creator from this document? Who do you think is the target audience the creator had in mind? Why do you think so? After looking at and analyzing this document, what is the main idea of the document? When all groups are done with the above analysis of all three of their documents, I will ask each group to get up in front of the class. While I project the images in full size and in color on my SMART Board, they will lead a class discussion in the analyses of these rich images. I hope that, inevitably, students will notice details they didn't on first glance. Maybe some groups, who thought they had done a thorough job before getting up in front of the class, will even learn from their audience during these discussions. Taken together, what emotions or ideas do these documents demonstrate? Use words or images from your documents as evidence of these emotions and ideas. My hope is that the answers will be thoughtful and that the students will point to specific details or words used in the documents that convey the emotions of the time period. The goal is for them to have a greater understanding of what is must have been like to live during these tumultuous times, based on the words and images created by the people who were there. Now that the second half of the school year is well-underway, I am becoming more and more cognizant of the fact that I need to teach my freshman students certain skills to prepare them for the larger-scale research projects that await them in their sophomore classes next year. One of those skills is historical context. The context is understood as the events, or the climate of opinion, that surround the issue at hand. They help to understand its urgency, its importance, its shape. What was happening at the time of the event or the decision that sheds some light on it? In what type of society did the event occur? An urban one? A rich one? An educated one? I wanted to come up with a fun way to teach my freshmen this concept. So, I opened the class with an explanation of historical context. We happen to be studying American colonial society prior to the American revolution. So, the two issues I chose to highlight were the Great Awakening and colonial westward expansion into Native American lands. Each group received one primary source quote or excerpt to analyze. They did some pre-reading the night before, and now they had to apply that knowledge and set up the historical context to explain how people of the time might feel and why they might make the statements assigned to them. Click here to see the handout they received. I published the podcasts before the kids even left the classroom using my PodBean.com account. PodBean is easy to use. If you know how to write a blog using Blogger or WordPress, PodBean is relatively intuitive. Finally, to follow up on the lesson and ensure that everyone got the historical context for all of the quotes, students were assigned to go online and listen to the podcast one more time for homework. They were to take notes on the historical context explained by each of the other three groups on their handout from class. It reinforced and reviewed the reading and outline work they had done the night before. They got to work in groups and talk to each other throughout the class (it was a student-centered activity). They love publishing podcasts online. Fourteen and fifteen-year-olds love to hear their own voices! Also, I often send emails home informing parents when we publish podcasts or videos from class. Parents love hearing what their children are learning directly from their mouths and in their own words. It was quick, one 55 minute class period. The kids were engaged and motivated the entire time they were in class. The work they are doing is applying the knowledge they have already learned. It isn't about spitting back information they memorized, it is about higher order thinking. Also, I tend to get a lot of feedback, from both parents and students, when our lessons result in something we publish. Parents email me and comment on the actual podcast. I can also see how many "hits" each podcast gets right on the PodBean site, so I know that students are going back and listening. Inspired by both Greg Kulowiec's presentation at the MassCUE Conference in October, 2010, and Common Craft, I assigned a low-tech/high-tech project to my honors freshmen students as they learned about everyday life in the American colonies prior to the Revolutionary War. The essence of Common Craft videos on YouTube is to "help educators and influencers introduce complex subjects." Lee Lefever and the people at Common Craft are geniuses in the art of simplification in their "In Plain English" videos. They take processes and concepts, like the electoral college, that seem complicated at first and break them down so almost anyone could understand them within short 3 minute episodes. They use simple paper drawings and cut outs and move them around with their fingers on screen while narrating and explaining what the audience is seeing. So, I asked my students to do the same thing to explain the everyday lives of people living in colonial America in the 17th and 18th Centuries. Here are a couple of great examples of my students final videos. If you would like to see more about farmers and fishermen, women, and printers in the American colonies, check out my Kerry Hawk02 YouTube Channel. Student Work Ethic - Students had only three days to read information from their textbook and various scholarly articles, synthesize it into a script, storyboard the video, create the drawings, rehearse, and film the final cut. The quick turnaround encourages them to work efficiently together and even assign each other homework over the intervening evenings. Their work ethic was great! Checking for Understanding - By simply watching them go through to process and then watching the final 2-3 minute videos I can tell that they understood all of the information they were assigned and were able to put that understanding into their own words in a simple but creative way. Plus, the kids had fun. Low Tech Process and a High-Tech Product - While the final product is work that is published to the world online, the preparation did not require a computer lab, which can be tough real estate to acquire in any school building. All I needed to do was sign out a FLIP camera from my school library for two class periods and upload the videos to my free YouTube Channel. Easy! Approved For All Audiences - The product of the project is easy to understand, so students can share it with all members of their families. But also, I think a version of this project could be implemented in any classroom, elementary through high school. A student who worked on the project has a mother who teaches at the elementary level. She said her mom loved the idea and is going to do the project with her younger students too! I hope you enjoyed watching and reading. We certainly enjoyed making these videos for you! There is a great beauty in life that we fail to recognize until something, some experience or some knowledge, gives us the gift of perspective. 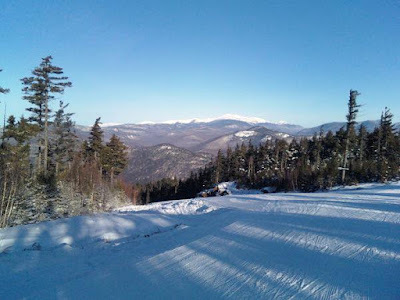 I have personally gone through some difficult moments recently, but I was reminded of the great beauty of life last week as I got off a chairlift and buckled down my ski boots for the first run of the day at Attitash in Bartlett, New Hampshire. Rarely do we teachers get the opportunity to give our teenage students, who are caught up in a material and highly virtualized world, such perspective. 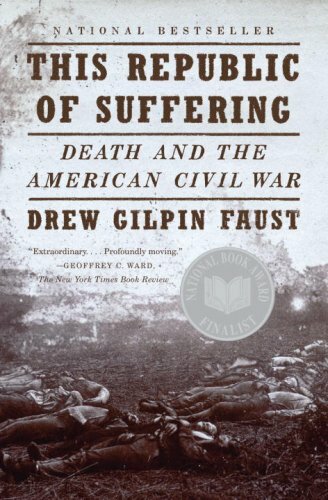 There are countless passages and examples of the lives and deaths of ordinary soldiers throughout Drew Gilpin Faust’s book, This Republic of Suffering: Death and the Civil War. This book just might provide us teachers with that opportunity. 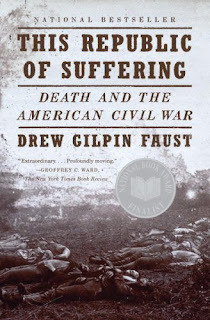 Faust is able to present ample evidence to prove that the nature of death and the American understanding of what death meant changed as a result of the war. 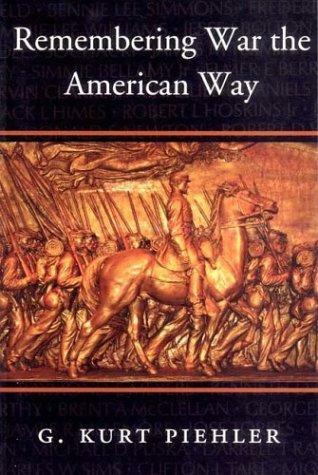 The study of these ordinary soldiers is important for our students’ learning and understanding of the intense impact of this war on American society, economics, politics, and culture. To understand this shift I might first explain what ars moriendi is. Students need to understand that a proper death at the time was at home, surrounded by loved ones, prayerful, and followed an honest profession of sins in a Christian mindset that allowed for both the dying and the living to be secure in the fate of the soul of the moribund. Next, the passages I might use with students would include the stories of soldiers who struggled with the fact that they did not know when they would die and were therefore denied ars moriendi. The burial ceremonies and huge numbers of citizens in attendance for the burials of Thomas “Stonewall” Jackson and Abraham Lincoln demonstrated the overwhelming desire of the public to compensate for the time they lost when denied ars moriendi. The compositions of Walt Whitman about Lincoln are especially expressive of this mourning that the whole nation shared. While the lines are outwardly about Lincoln, they seem to hint at the hopes and dreams of all soldiers who fell before him. The entire book is difficult emotional reading. Probably too much for the average teenager to handle. But a few carefully selected excerpts put in the right context could help our students gain some much-needed perspective on the value of life and the great suffering others have endured so that we have the opportunity to live. The John Booker letters are great examples of the realities of participation in wartime. They demonstrated that the initial enthusiasm and adventure-seeking that motivated young men to volunteer and enlist faded away when the realities of war became evident. Booker, a Confederate soldier, probably enlisted with his brother and friends to preserve their way of life and defend their homes and families. Over time, he realized that war is not always about these heroic intentions. 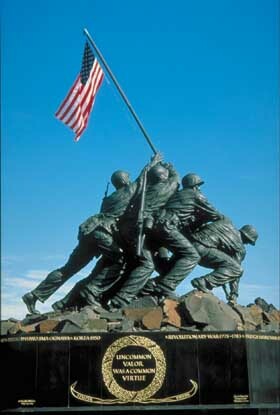 It may start out that way, but when it comes down to doing the work of war, it is unpleasant, unfair, and isolating. Booker's participation was punctuated with frustration and disillusionment. He was frustrated with his officers and his family and friends at home as well. His officers seemed unaware of the importance of fairness among their men. Christmas is close by and I see no chance for me or James to get home. I would like the best in the world for one of us to get home by Christmas if we could ans I think one of us was to get a furlough and if the officers would do right we would get one. But if they can get home whenever they please, they don't care for us. Furloughs were obviously highly valued, and granting them in a fair way was essential to maintaining the loyalty and motivation of the men. Additionally, Booker saw right through the governor's strategy to give the men an impossible choice when trying to get them to reenlist in the Confederate Army. The Governor came out the other day and made us a speech an tried to the get the men to re-enlist for the war, and when he had quit speaking the Colonel had us all in line and then the Colors carried to the front and then told all the men he wanted all who were determined to be freemen to step out on the line with the Colors and all who were willing to be slaves for their enemies to stand fast. ...I didn't wish to be in either line. ...I believe that as long as we will stay here and express a willingness to stay here our leading men will keep the war up. Booker argues that he wants peace and seems to believe that the officers and political leaders do not, but they need young men like him to fight their war for them. Our students might look at this and try to connect it to the strategies that politicians use today to convince their constituents that their legislative agenda/campaign platform/party tagline is the best. Most interesting, and sad, to me was the fact that Booker seemed truly upset that the letters from family and friends did not arrive often enough. 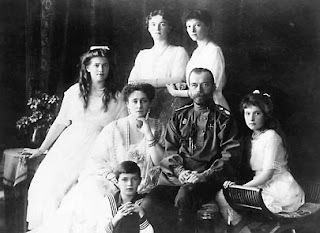 I am sure there is nothing that affords me more pleasure than to receive a letter from any of my friends or relations at home. But it's seldom I get a letter. I had been expecting a letter from you two or three weeks before I received it. I take this opportunity of responding to your most kind and interesting letter of the 10th of last month which was so long coming to hand I had begun to think that you had given out writing to me anymore or had written and I had failed to get your letter, though I suppose your letter were on the road longer than it ought have been. This point would not be lost on our students given that American men and women are serving in Afghanistan and all over the world. There are many opportunities for them to send their thoughts, well-wishes, and even a few tokens of gratitude to these people who make great sacrifices. Students might draw from these primary source documents that participation for an individual can change over time. Booker is a hero, but is story is not an ideal one. It would be a great way to show students how true heroics are achieved. My freshmen are studying 17th Century European absolute monarchs. In an effort to keep them on task before the much-anticipated winter holiday break, they are recording podcasts about Louis XIV of France. Click the link below to hear what they wrote and recorded. I think they did a pretty decent job with both the history content and writing. Feel free to comment. They would love to hear from you! Thanks for listening.